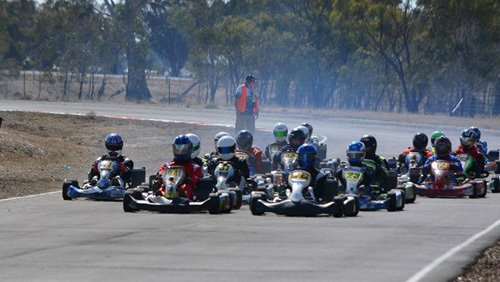 Round two of the AUSTRANS Victorian Country Series at the Wimmera Kart Club took place on april 12 with over 160 karters taking to the small Horsham Circuit. 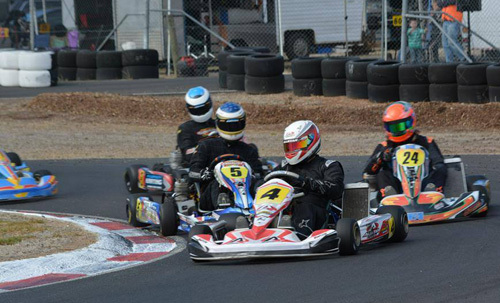 The racing was thick and fast and some classes finding new championship hopefuls! 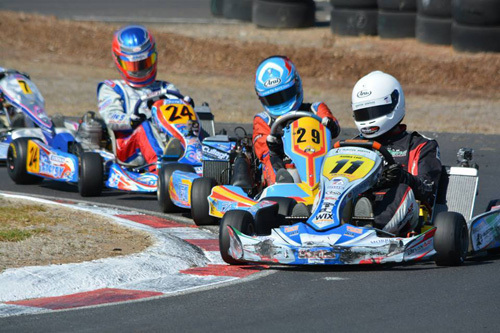 As has been for most of events this year the battle was a two horse race between BRM driver Matthew Domanchenz and Redspeed karter Will Harper! Domanchenz led off the line with Harper into second followed by Anton Hortis. Domanchenz and Harper argued for the lead with Harper making a move for the lead on lap 3. What was looking like a screamer of a finish between the two ended when a red flag incident shortened the race. All drivers were ok being the main thing, but Harper took the round win in a great battle with Domanchenz and Anton Hortis rounded out the podium. Beau Russell and Jaxon Johnstone round out the top five in the field. 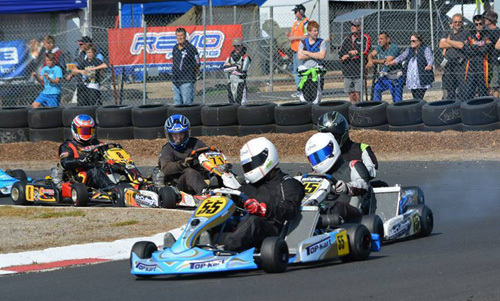 Tex Starr-Mckoy was the standoutout performer in Cadet 12, taking a clean sweep and pole position. Mckoy lead off the start and was able to open up a margain leaving a great battle between Jobe Stewart and James Wharton for the final podium spots. Wharton tried multiple times to have a look up the inside of Jobe Stewart with the battle intensifying in the final few laps! Mckoy was able to take a dominant win with Stewart coming out on top of Wharton for second spot. Amber Miller recovered late in the race to come home in fourth spot with Bronson Boult rounding out the top five. 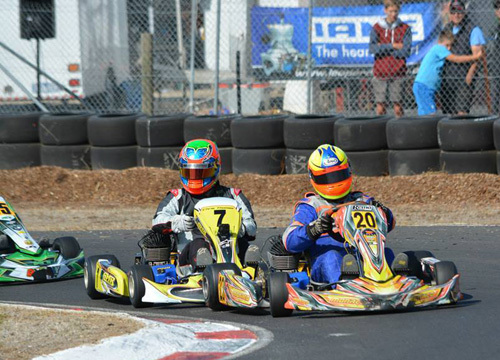 Corey Arnett, Courtney Prince and Jaxson Cox all battled for the win in Junior National Light with Arnett taking pole position and himself and Prince shared the heat wins making for an intense final! Arnett got the jump off the start with Prince having a shocker going back in the field. Cox quickly jumped to the lead. Arnett jumped back to the lead and wasn’t then head and took the round win from Cox in second spot with Jack Hutchins rounding out the top 3. Nick Schembri came home in fourth spot with Courtney Prince rounding out the top five recovering to fifth. 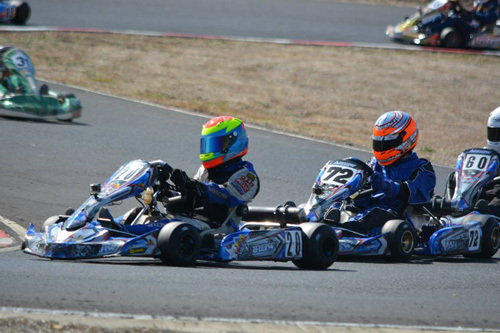 Cody Donald dominated the opening round of the Victorian Country Series and things were no different in round two with Donald taking pole position and clean sweeping the second round of the championship. The battle for second was between Michael Clemente, Nick Carroll and Alex Baker. Donald led away of the start With Carroll swapping into second place followed by Clemente. Clemente and Carroll had a great battle for second spot with Clemente eventually getting through. Donald took the round win from Clemente and Carroll. Alex Baker came home in position four with Giles Rogers rounding out the five. 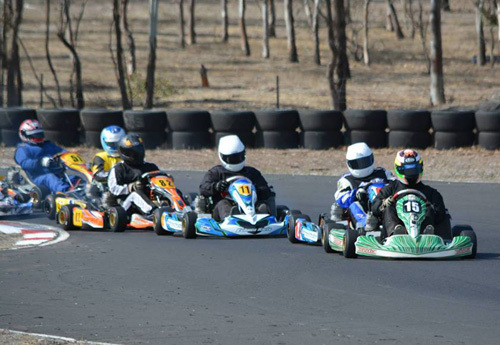 Max Vidau took pole position in Junior Clubman but it was Domenic Romeo and Benjamin Delaney taking the heat wins but Cody Donald took the most points from the heats and was off pole position in the final. Donald led away off the start with Hamish Ribaritis and Domenic Romeo slotting into second and third. Romeo jumped up into second spot and went in chase of Donald in the lead. In a frantic last few laps Romeo closed right in on the back of Donald making for a grand stage finish! Romeo was able to make a last breath pass on Donald with two corners to go to take the win. Donald finished in position two with Ben Delaney third. Max Vidau finished fourth with Hamish Ribartis rounding out the top five. Chris Thomas took pole position over fast and experienced local Remo Luciani with Heath Jelbart rounding out the top three. Thomas had two great heat battles with Luciani with the latter taking the stranglehold on the class taking out both heat wins. Luciani was off pole position and took the lead with Phil Smith slotting into second spot and Thomas falling back to position three. Thomas moved quickly back into second spot. With many lead changes the Clubman Heavy final was a good one with Luciani taking the overall win with Thomas and Smith rounding out the top three. David Rinaldi and Heath Jelbart rounded out the top five. 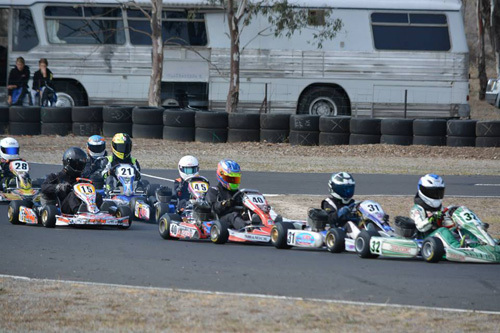 30 karters took to the start of Restricted Light meaning on the small gridded Wimmera Kart circuit put the karters into split heats with Joseph Clough, Jordan Rae and Brayden Flood taking the three heat wins. Jordan Rae led away in the final with Brock Rae and Joseph Clough slotting into third. Flood who starting in sixth quickly made his way into second spot to chase down Rae in the lead. Flood put in a great chase to get to the back of Rae and with two laps to go made the race winning move! Flood took the final win over Rae. Joseph Clough, Brock Rae and Steven Campbell rounded out the five. Above: Restricted 125 Light take a start! Paul Feely was able to take Restricted Heavy pole for the second round in a row but it was Chris Rodda who took the opening heat win. Feely was able to take out heat two setting up for an exciting final race! Enter Nicholas Wortley. Wortley led away at the start and was never headed leaving the battle for the minors between Paul Feely, Chris Rodda and John Dankowski. Wortley was able to take a strong final win over Dankowski who was able to take second spot over Feely. Rodda came home in position four with Craig Widgery fifth. Andrew Hayes was again the dominant force in Restricted Super Heavy taking pole position and both heat wins and looked as though he was going to take another clean sweep however the final brought a stop to Hayes’ dominance. Martin Golledge got the jump off the start and led to turn one but disaster struck for Hayes when contact between himself and Peter Sloan sent both karters to the back of the field leaving Golledge and Stephen Kerwood to argue for the win. After an early race battle, Golledge was able to take the win over Kerwood. Kevin Hitchcock, Marc Tune and Jason Kilcullen rounded out the five. Ash Lear was one of the major talking points leaving round two of the Victorian Country Series! Lear clean sweep round 1 and with another dominant performance took pole position and won all three races in another commanding display. Lear led away from the start with Will Carroll and Brad Marsh battling for second position! Lear took an easy final win with Marsh taking home second in a race long battle with Carroll. Maverick Benson and Bradley Saffin rounded out the top five. Current State Champion Scott King was again the dominant driver in the Tag Heavy ranks taking pole position in the class’s qualifying session. King was then able to take out both heat wins. 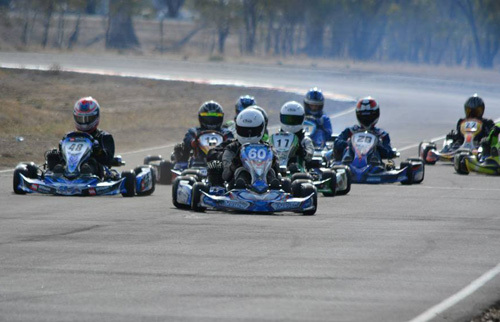 King led away in the final with Daniel Rethus and Brad Anderson slotting into second and third. 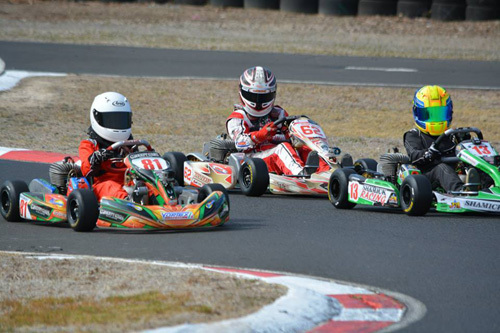 King was challenged early in the race by Rethus until kart issues halted his progressed! King took another clean sweep from Anderson and Leigh Bowler. Mitch Branson and Stephen Simpson rounded out the top five. 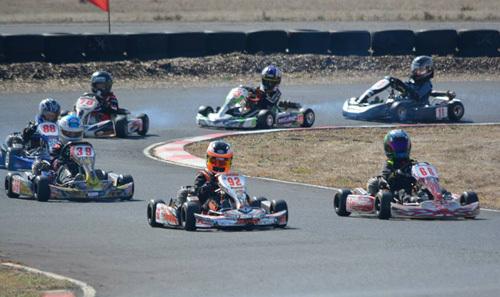 The next round of the Victorian Country Series will be at the Warnambool Kart Club on the 10th of May.